The Third Edge of the Sword: Is an hour of pleasure worth a lifetime of shame? Over at Down Goes Brown a recent post asks if the 2016-2017 Colorado Avalanche are the worst team of the salary cap era. I'm sure a lot of people asked the same question that commenter DK asked. I'm surprised the Oilers don't show up anywhere in this article. They were so utterly putrescent for so long, I thought for sure they'd at least be a contender in one of the categories (particularly the "optics" category; in the year they won the McDavid sweepstakes, they were the only bottom-feeders who didn't seem to be there by design and they still wound up a stone's throw away from the blatantly-tanking Sabres and Coyotes). 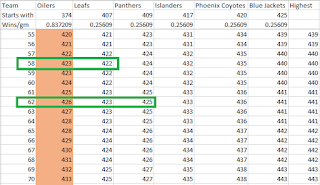 The quick answer to the question is that the comparisons were clearly being drawn against teams in a specific season. Funny as it might seem, the Oilers have a mediocre contender for this category. Their worst season was "only" 62 points. As you can see, that mark was beaten by six teams in the salary cap era, 7 times. An eight case would have been caused by the Florida Panthers in 2013: had they played a full season they would be projected to hit 61.5 points, so round whichever way you like to make the Oilers look bad. It still isn't that bad. With seven or eight other team-seasons to look at, the Oilers "Fall for Hall" season just didn't make the cut. You'll also notice that they haven't been very good. Sure St. Louis managed a 21-win season in 2005-2006 (the same season they traded Chris "Can't Keep it in his Pants" Pronger to the Oilers), but they also won 52. 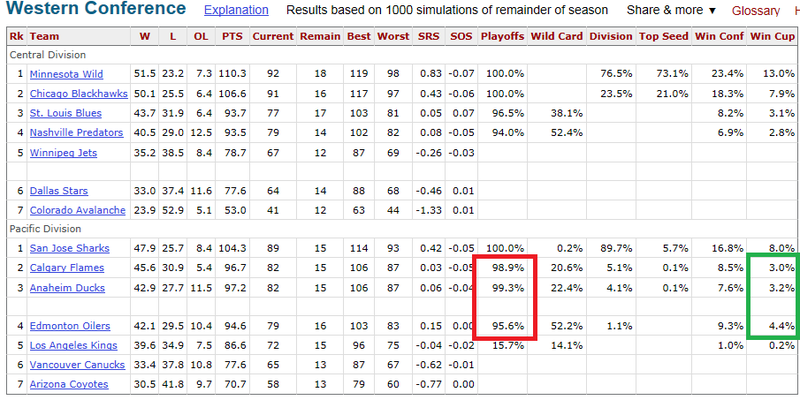 Hell, even the perpetually tanking Buffalo Sabres had a killer season in the salary cap era. The Oilers had a 41 win season that year they made it to the Stanley Cup Finals, but that's still just barely squeaking into the playoffs. You can be a bad team without being an atrocious team is what I'm saying, and the bad Oilers teams just aren't bad enough. 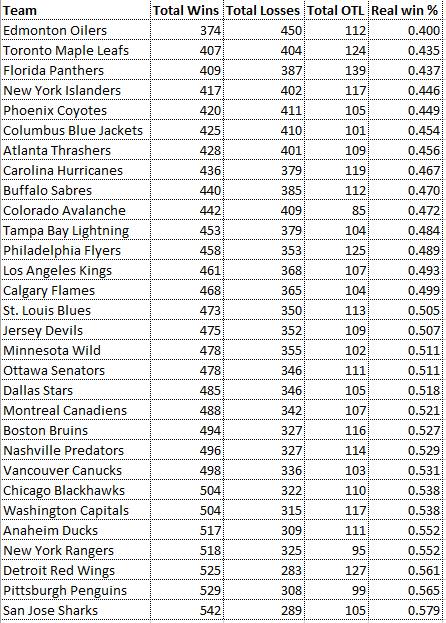 When looking at "who was the worst team in the NHL during the salary cap era" Edmonton just isn't in the conversation. 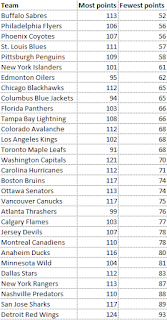 Here's a complete list of all 30 teams over the salary cap era† sorted by total number of wins. Try not to act surprised who's on top. † This ignores team naming and location changes, so the Winnipeg Jets are under Atlanta Thrashers, Seattle Coyotes are Phoenix Coyotes, etc. 33 games back of Down Goes Browns' Toronto Maple Leafs for "fewest regular season wins in the salary cap era", as of the morning of today: March 16 2017. (ie. it doesn't include the Oilers-Bruins game being played right now where Oilers have a 4-2 lead). That's easily more than double the next highest gap. That's patently ridiculous. 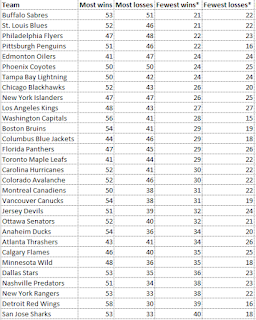 The Oilers are the worst by a substantial margin and that won't change anytime soon. Including tonight's Bruins game the Oilers have only 13 games left in the season. Say the Leafs stop winning games effective immediately. It means the Edmonton Oilers would need to win every game between now and November 21st (the date of the Oilers 20th game of the 2016-2017 season) in order to tie Toronto. 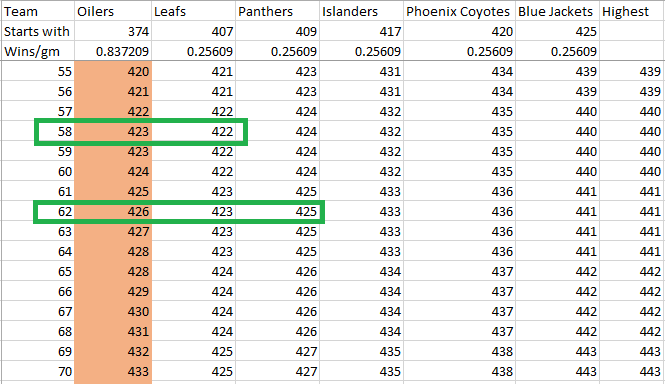 Another 3 games to pass Florida (assuming Florida and Toronto don't play each other over that same span). But that's unrealistic. Let's do something a little more realistic. 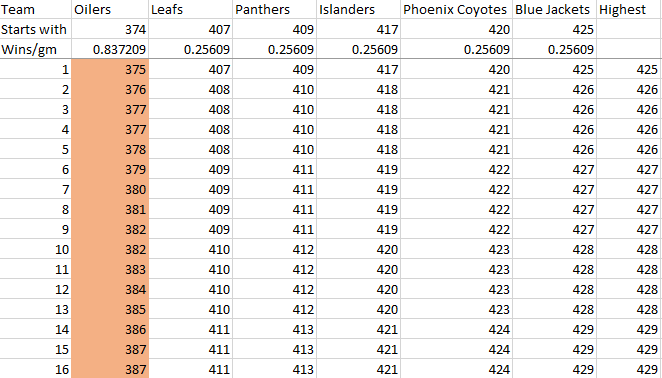 Let's imagine the Oilers starting today put up historically high win percentages while the Leafs, Panthers, Islanders, Coyotes, and Blue Jackets all put up historically low win percentages. 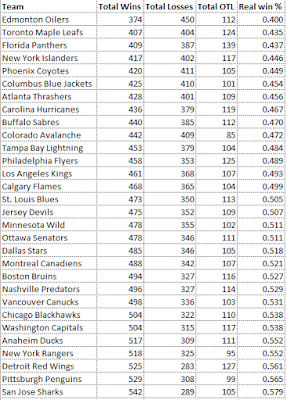 The best win% was the Chicago Blackhawks in 2012-2013 who put up a .802 win percentage. 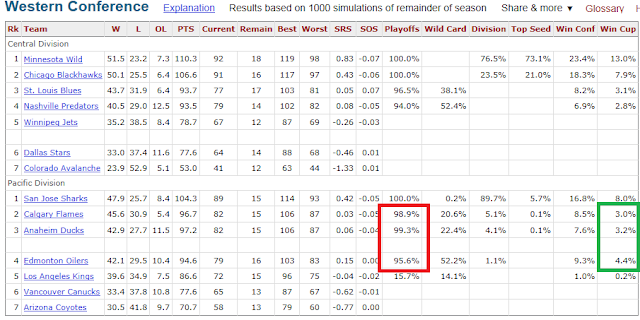 Now factor out the 1/9 games that feature an OTL and you get the Oilers putting up a .837 win percentage. See, that's way more realistic than winning every game. 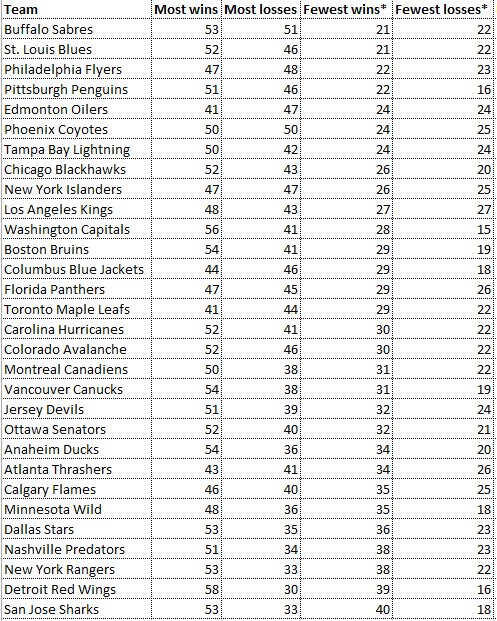 Now let's imagine all five teams the Oilers are chasing put up the same real win percentage as Buffalo did in 2013-2014: .2609. How long until the Oilers catch up? Well, don't hold your breath. 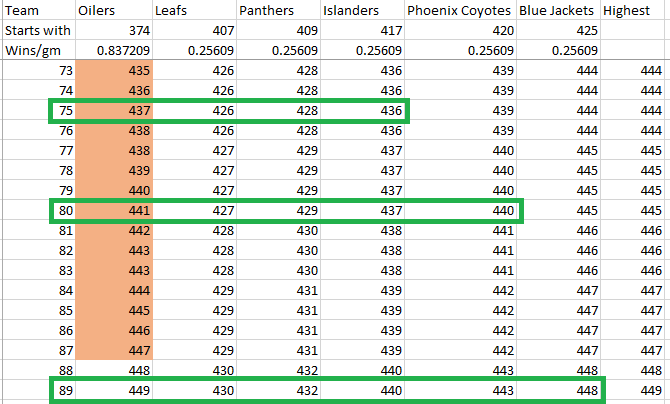 As our future begins, the Oilers start quickly banking more wins than the other four teams. But after the 13 games of the 2016-2017 season the Oilers are still way behind. After a whopping 58 games of this unrealistically high pace the Oilers finally surpass the Toronto Maple Leafs to be only the second-worst team of the salary cap era. 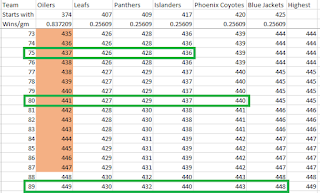 Four games later they finally pass the Florida Panthers and become the third-worst team. In 75 games the Oilers will pass the Brooklyn Islanders. 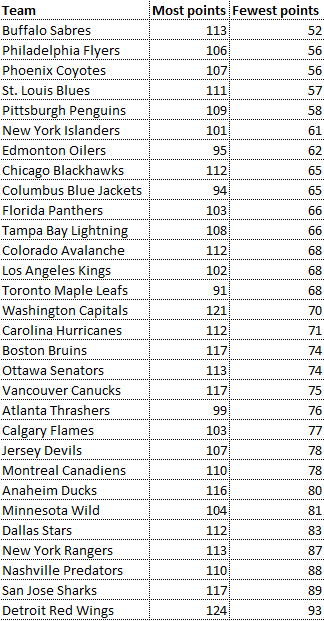 80 games to pass Phoenix (who may not even be Arizona by the time this scenario, which I remind you is literally too optimistic to be possible, comes to pass), and then finally after 89 games they pass the Columbus Blue Jackets to merely be the sixth worst team of the salary cap era. As I stop to yet again remind you that this requires the Oilers to set a new salary cap level of winning while all of their rivals become the 2013-2014 Buffalo Sabres, it still means the Oilers would be behind win-streaking, playoff-bound, suddenly cold Columbus Blue Jackets until 6 games remain in the regular season in March/April of 2018. DK (Darryl Kates?) is right. The Oilers are saved from discussion only because they are the worst over a much much longer and more depressing period of time than a single season. But hey, to borrow from the old joke in this post's title, at least all that historic failure paid off, right? The Oilers got McDavid and are making the playoffs, right? What can be depressing about that?